Pinned Golden Stage - Stage Three owner CCC Wealth with $400 reinvestment joined us on 14th of April. The project offers us middle term investment plan and many early investors are already with good profit from this project. From time to time, there are leader projects that dictate rules in the industry and other administrators follow because such investment plans or concept simply work out well. When I started blogging most popular was long-term HYIP standard, then trend moved to projects that pay profit + initial deposit included in the daily payments. Later arrived a time when "piggy bank" HYIPs ruled the world but straight after that there was just a mix of projects and nothing worked out. 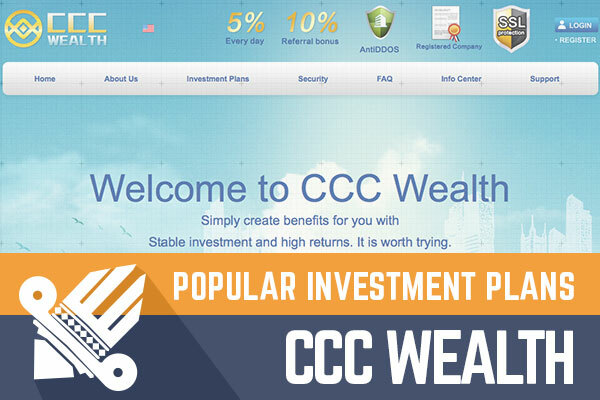 Time changed when projects like Carbon7, Amazing5, and Capital7 came around and they become so popular that others started to follow, and CCC Wealth is no exception. 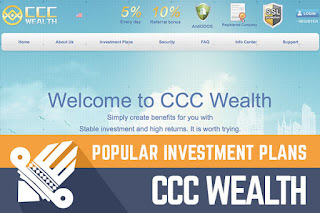 Yes, we can see that CCC Wealth on the website has many elements like Amazing5 has, but that is nothing bad - Amazing5 simply have proven that such plans, the design will work out and there is no need to invent the wheel for another time. CCC Wealth overall is quite a standard project, but as we see from EV SSL is is clear that administrator has money to operate this project and amount of promotional activities clearly confirms that. I will not write a lot about this project because it is quite similar to one proejct that we know very well, but I hope time will prove that this proejct will be very successful, and I will be able to write about it in the future as well. In any case - invest only what you can afford to lose. Investment plans: 5% daily for 30 calendar days, initial deposit included in the payments. 112% after ten calendar ways, initial deposit included in the payments.